KnowledgeBase Manager Pro is able to run indexation of files attached to knowledge base in order to make them searchable. Some documents can be searched without any additional tools, others need PHP modules enabled or third party tools installed. All modules and tools are free. MS Office 2003 Word Documents = Supported formats: .doc, .dot. AntiWord (free) is required. MS Office 2003 Excel Workbooks = Supported formats: .xls, .xlt. Indexation tools are already built-in. MS Office 2003 PowerPoint Presentations = Supported formats: .ppt, .pot. ppthtml (free) is required. MS Office 2007 Word Documents = Supported formats: .docx, .docm, .dotx, .dotm. PHP ZIP library (free) is required. MS Office 2007 Excel Workbooks = Supported formats: .xlsx, .xlsm, .xltx, .xltm. PHP ZIP library is required. MS Office 2007 PowerPoint Presentations = Supported formats: .pptx, .pptm, .potx, .potm. PHP ZIP library is required. MS Office 2007 Visio Drawing = Supported format: .vdx. Indexation tools are already built-in. Adobe PDF Documents = Supported format: .pdf. pdftohtml (free) is required. RTF Documents = Supported format: .rtf. unrtf (free) is required. Plain-text Documents = Supported formats: .txt, .htm, .html, .shtml, .shtm, .txt, .php, .asp, .cfm, .cfml, .pl, .cgi, .aspx, .jsp. Indexation tools are already built-in. Images = Supported formats: .jpg, .jpeg, .tiff, .tif. Meta data is indexed, not images by themselves. PHP's EXIF library (free) is required. You also need to enable several PHP modules in order to use search indexation of MS Office 2007 documents and images metadata. Check if the following files exist in that folder: php_exif.dll, php_mbstring.dll, php_zip.dll. If any of these files do not exist, you should run PHP installation and install appropriate module (Exif, Mbstring, or PHP ZIP respectively). Open the php.ini configuration file of your PHP engine. You should enable these modules by removing comment symbol (#). Be sure to move the php_mbstring.dll entry before the php_exif.dll. It won't work otherwise. If you have PHP v5.3 or higher, you do not need to enable PHP ZIP extension. It is already built-in to the PHP engine. We strongly recommend you to use the latest version of PHP. These plugins work under PHP v5.3+ correctly. Earlier versions of PHP have bugs and may freeze when launch external programs (e.g. attachment indexation plugins) using Windows command line. PHP v5.3 doesn't support ISAPI anymore. So you need to use FastCGI instead. Download the indexation-plugins.zip and antiword.zip attachments below. 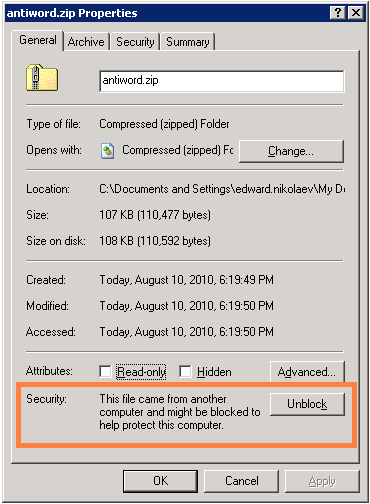 Open properties for each zip file and check if they are not blocked by Windows "for security reasons". If yes, unblock them. Extract the contents of the indexation-plugins.zip to the \admin\application\libraries\search\plugins folder of your KMP installation. Add read and execute permissions for the web-server to the \admin\application\libraries\search\plugins folder and its contents. If your server runs under IIS, you should grant the Internet Guest Account with the read and execute permissions to that folder. If it is Apache server, you should check which user runs the Apache process and grant read and execute permissions for that user. Extract the contents of the antiword.zip to the C:\Antiword\ directory. Add read and execute permissions to this folder and its contents as well. Add read and execute permissions to the %windir%\system32\cmd.exe file (c:\windows\system32\cmd.exe by default). Typically you need to add read and write permissions to that file for the Internet Guest User (IUSER_SERVERNAME or IIS_IUSRS), but this may differ on your IIS installation. If you can not change cmd.exe attributes due to company policy or lack of permissions, you can copy this file to any directory listed in system PATH environment variable and set read and execute permissions permissions to it there. Go to the KMP control panel. Go to the Administration > General Settings > Search. Set checkbox on the "Enable Attachments Indexation" and on each document type entry and click "Save". Now you can upload attachments and they will be automatically indexed for search. You can also run indexation for existing attachments. You need to install cron script to do that. Currently PPT and RTF indexation plugins are not available for Windows servers. Please note that if you're installing unRTF from tar.gz package, you should use version 0.19.3 (unrtf-0.19.3.tar.gz file). This is the correctly working version - newer versions doesn't work properly and hang the indexation process. Find the "extension_dir" parameter. It indicates the path to PHP extensions directory. Go to that directory and check that exif.so and zip.so files do exist there.